There's this great scene in Diner where Daniel Stern loses it because his wife misfiled one of the albums in his precious record collection: the shouting match ends with her screaming (sensibly enough), “Who cares what's on the B side of ”Blueberry Hill?“ and him screaming that he does, because music is the history of his life, of their life. Which, in a way, is true. Dumb, but true: it does all matter—names, dates, personnel, your opinions, someone else's opinions. Music is not just product, it's the real thing (anyone who's witnessed a ”Beatles vs. Stones“ argument can vouch for this). This may explain why it's one of the most popular topics on the Web; popular enough to make your search engine seize up when you type in ”music." So here, to save you from that and get you started, is the tip of the iceberg. 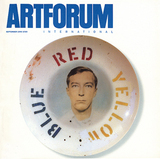 Mark Van de Walle is a frequent contributor to Artforum.